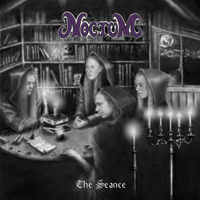 Following the cult of Swedish underground band, NOCTUM released their debut album a small DIY US label in 2010. During the time the band built up a stronger reputation in Europe, but the European edition was missing. High Roller put out limited vinyl editions, but still no CD edition. So Transubstans picked up the band for the debut album, and will soon release this CD edition including both the "The Seance" and "The Fiddler" on 1 release. Swedish deluxe occult metal drenched in blood ripping stories about witchery, blood and black masses. For friends of WITCHCRAFT, ANGEL WITCH (old), GHOST (SWE) and BLACK SABBATH.